How mature is your pricing organization ? Many European based organizations have only just begun to realize how significant the effect of pricing on shareholder value creation really is. Until now, the focus was mainly on innovation, sales and marketing – and justly so. But in today’s economic environment, value capturing (effective pricing) is increasingly being discussed at the boardroom table as one of the main shareholder value drivers. The domain of ‘Pricing’ is in full development and many companies install Pricing teams who almost immediately realize successful margin improvement projects. These are the ‘quick wins’ in the discipline of pricing. But we need to go beyond the low-hanging fruit ! The next step proves to be more difficult : embedding pricing knowledge in the organization, thus moving away from pure project-driven pricing. European pricing professionals have come to recognise that a lasting change and full impact on profit optimization requires a comprehensive approach. Crossing this chasm is not an easy expedition. As a result, many pricing practitioners, management teams and CEO’s are searching for a structured approach to guide their organizations towards higher pricing maturity, leading to profit optimization. They asked the EPP : where do we start and what are the priorities? Who should we learn from? Apple? Bose? 3M? Bayer? Audi? Microsoft? Michelin? Hilti? The Rolling Stones? Is there a proven path to superior pricing ? The answer is Yes ! There is a proven pricing maturity development path. The maturity model concept, as a tool to enhance organizational capabilities, was popularised by the Carnegie Mellon University in the 90’s. 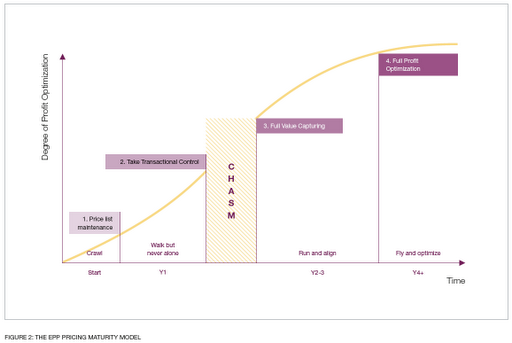 Their first Capability Maturity Model (CMM) was developed for IT management, but in the meantime, nearly every management domain has maturity models to draw upon. A maturity model defines a set of structured levels that describe how well the behaviors, practices and processes of an organization can reliably and sustainably produce required outcomes[i]. 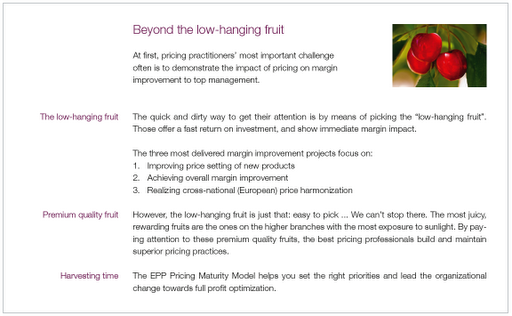 At the EPP, we have gathered a treasure of time-tested best practices from the leaders in the field of pricing to come to a practical pricing maturity model to support pricing practitioners in Europe. It’s a hands-on, pragmatic instrument and it is our mission to share it with you. The emphasis of this white paper is to help you identify where you are today in your pricing journey, which areas you need to prioritize and improve to lead your company to the next level of pricing maturity (and profit optimization) – and perhaps most important : how to cross the ‘Pricing Chasm’. the form of a free, in-depth, on-line survey. In the early stages of their pricing development, organizations often focus first on margin improvement projects. These pricing projects (the low-hanging fruits : see frame) bring the desired visibility at board level, but pricing professionals soon grasp that full value capturing is much more complex and challenging. Improvements do not come from better price setting alone. You have to develop and align your capabilities in all pricing building blocks. We visualise this by means of the EPP Pricing Framework. 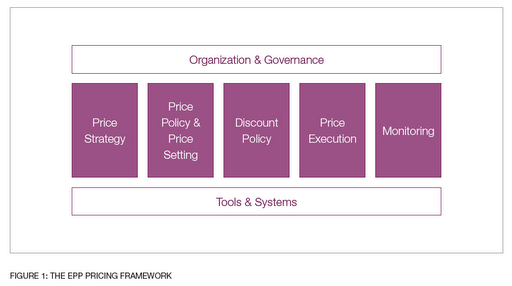 There are five core processes : Price strategy, Price Policy & Setting, Discount Policy, Execution and Monitoring – and two supporting building blocks : Organization & Governance and Tools & Systems. When you have a pricing audit done, they always reveal weaknesses/improvement opportunities in all building blocks. This results in a long list of capability gaps and organizational challenges. As a result, we see top management often struggle to allocate the right priorities in this list. How do we set priorities for Pricing ? The EPP Pricing Maturity Model helps you determine which level you are operating on, how to prioritize your efforts, and how to cross the pricing chasm to realize profit optimization. We consolidated real-life best practices and advice from Pricing leaders, experienced in pricing maturity development across all industries, into the EPP Pricing Maturity Model. Under optimal conditions, it will take you at least 3 to 4 years to bring your organization from level 1 to level 3. It is essential that you have the full cooperation and support of your most important stakeholders in realizing the change: top-management, marketing, sales, finance (and IT). Do the right things first and never walk alone; if you keep these two key things in mind, the likelihood of success in your pricing journey increases sevenfold! price lists. Mainly cost-plus pricing. Chasm that needs to be crossed to get to the next stage of pricing maturity. Take the time to download the full whitepaper here : a couple of seconds now, could result in a lasting impact on your bottom line ! for a list of the EPP expert pricing partners.